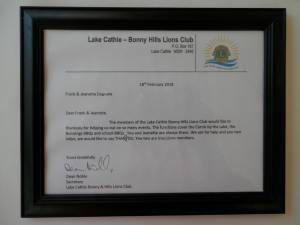 Presented to Lions Jeanette and Frank Deguara at the Port Macquarie Golf Club on 23-2-2018 by the President Angelo Mifsud of the Tacking Point Lions Club. Presented to Lions Jeanette and Frank Deguara for assisting with various functions in the community. The Banner was presented to Jeanette and Frank Deguara by Roger Sherrington at a Lions Club Dinner at the Richmond Golf Club NSW on 28th March 2017.